Not that you necessarily want to turn your Android Wear watch into an Apple Watch of course—but it’s fun to take a look at what’s possible. You can easily get notifications, play your music, check the weather, search online, get walking directions and so on on both platforms, so we’re going to focus on a handful of features that are distinctly Apple Watch. This is an easy one: The upcoming Android Wear update from Google is going to include support for doodled emoji, so all you really need to do is wait for the software to appear on your phone. Scribble out a shape and your watch will convert it into a colorful character ready to send to a friend. If you want to do some more detailed doodling, similar to the way Kevin Lynch demoed on stage at the Apple launch event in September, then try Draw Watch—it’s not the most sophisticated drawing app you’re ever going to find but it lets you use multiple colors then share your creations with others. You can’t see very much of a photo on your wrist, but nevertheless Apple has baked the functionality right into the Apple Watch software. If you want to be able to flick through your pictures on Android Wear, then MyRoll Gallery is probably your the best option at the moment. Even if you don’t have a wristwatch to go with your smartphone, it’s a very capable Android app in its own right, offering advanced tools for organizing and sharing your pictures from your mobile devices. The Android Wear extension lets you view, delete and share images with a few taps on your Android Wear smartwatch. Apple Watch uses a swarming map of colored icons to represent apps on your wrist, whereas on Android Wear you’re relying on lists and voice control to bring up whatever it is you need. Enter Bubble Cloud Widgets + Wear, which replicates the bubble effect on your Android smartphone and smartwatch. You can even place contacts inside some of your bubbles if you wish, so you get the contacts screen and the apps screen of the Apple Watch combined together. If you don’t take to it, then Wear Mini Launcher is another powerful and free launcher app that gets your shortcuts together in neat rows and columns. If there’s a particular Apple Watch face that’s caught your eye and you’re a little nonplussed that you can’t get it on Android Wear, give WatchMaker Premium Watch Face ($1.50) a try. You might not be able to recreate all of the Apple Watch faces in exact detail but you can exercise your creative talents and give it a go. There’s a strong community of users behind the app as well, so you can get inspiration and borrow faces from other people working with the same set of tools. Android Wear Faces Creator isn’t quite as comprehensive in terms of features, but it is free to use and won’t take you long to get to grips with. 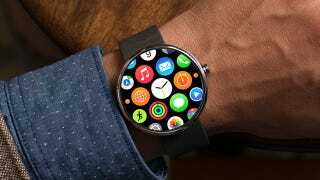 Instagram has been heavily featured as one of the Apple Watch apps that will be ready when the wearable breaks cover—it’s been widely used in Apple’s promotional materials and on its website—and while there’s no official support for Instagram on Android Wear there are some alternatives you can try out. Wear for Instagram is going to set you back $1.50 but it lets you view and like Instagram photos and comments from your wrist. Similarly there’s Instant for Android Wear, free to install, which also gives you access to photos, comments and likes, and enables you to show some love to a picture with a double-tap. The special ‘taptic feedback engine’ in the the Apple Watch has been getting a lot of attention and with good reason. Individually customized buzzes and prods can let you know what type of notification is coming through without you even having to turn your wrist to look at the watch face itself. Android Wear can’t quite match that kind of subtlety, but you can use Augmented SmartWatch Pro ($3.50) to get “smart haptics” on your Android Wear device. Again the end result is that you’ll be able to tell what kind of notification is coming through just by the buzz on your wrist. Apple devoted plenty of time to health and fitness at the Apple Watch launch event, and while Google doesn’t seem to be quite as ambitious in this area right now, Google Fit is still a worthy competitor—unlike Apple Health, you can get at all of your activity data on the web as well as through your mobile. You can start and stop workouts from your wrist, and of course the sensors built into whatever Android Wear device you have can help with step counting and heart rate monitoring. Some Google-powered watches have standalone GPS too, handy if you want to leave your phone at home while you’re jogging. Well, this is just a rumor, but a pretty credible one nonetheless—after all, iPhones support everything from the Chromecast to Google Maps, so there’s no real reason why Android Wear couldn’t be added to the mix too. Sit tight and there might be some news in store at I/O in May. In the meantime, if you want to hack together something that passes notifications from an iPhone to Android Wear, then check out IFTTT: Android Wear notifications are one of the actions you can use in your recipes, so you can pass over alerts for a lot of apps with just a few IFTTT procedures.